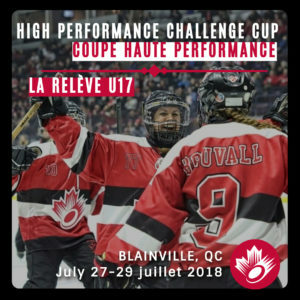 High Performance Challenge Cups are three-day events hosted with the intention of bringing in the top Senior National Team prospects together to train, compete and learn about Ringette Canada’s HP programs and philosophies. The goal is to increase the number of High Performance athletes involved within Canada’s National Team Program. This will also serve as an opportunity for prospects to understand the requirements and the lifestyle they can expect should they wish to pursuit the HP pathway as an athlete. This 3-day event also includes coaching and officiating development all while remaining athlete centered to provide these athletes with a once in a lifetime experience. For the 2019 National Team cycle, Ringette Canada is expected to host 3-4 Challenge Cups leading up to the 2019 World Ringette Championships. For information on the November 2-4, 2018 event, please click here. For information on the July 27-29, 2018 event, please click here.